Matt Bowman threw a complete game shutout on Sunday. There were two incredible performances from Big Train pitchers this week. The first came from UNC-Wilmington’s Kelly Secrest (BT ’11-’12). Secrest entered the game with the bases loaded and two outs in the 4th inning in a game Wednesday against Elon. Secrest struck out a batter to end the inning. He went on to retire the next 15 batters in a row to end the game and earn a victory. Though that would be notable enough, Secrest actually tied the record at UNC-Wilmington for strikeouts in a relief appearance as he struck out 12 of the 16 batters he faced. However, Secrest was not the only Big Train ace with a big time performance this week. 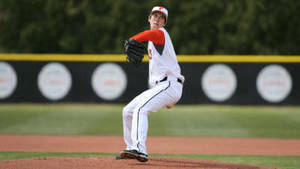 In the first half of a double-header at Cornell on Sunday, Princeton’s Matt Bowman (BT ’10-’12) pitched a seven-inning shutout. Giving up only two hits and two walks, Bowman struck out 11 hitters as he went wire-to-wire to earn the win in the shortened game. Other notable pitching performances: Ryan Garton (BT ’11 / Florida Atlantic) - 7IP, W, 2ER, 5H, 4BB, 8K… Martin Agosta (BT ’11 / St. Mary’s (CA)) - 7IP, W, 5ER, 9H, BB, HBP, 8K… Patrick Keane (BT ’10-’11 / St. Mary’s (CA)) - 3IP, 2SV, H, 4K. Notable hitting performances: Brendan Kalfus (BT ’11 / St. Mary’s (CA)) - 9/13, 4R, RBI… Michael Bass (BT ’11 / UNC-Wilmington) - 8/17, 2BB, 4R, 3RBI… Mitch Morales (BT ’12 / Florida Atlantic) - 4/10, 3BB, R, 2RBI, 3B.